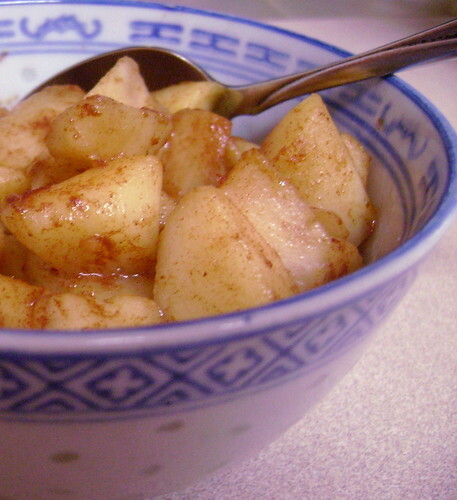 Simply sauteed apples with cinnamon, in a bit of coconut oil instead of butter; the coconut oil leaves a nice buttery after-flavor. Currants or raisins can be added, and it’s also sometimes nice to round off the flavours with vanilla extract. Servings vary according to amount of apples, as well as individual appetites: usually 2 apples will be enough for two servings, and so on; make recipe accordingly. I use a small saucepan in the instructions, but if you are making a larger amount a large fry pan may be in order, as the apples will have more space to cook. Good on its own, it’s also great with vanilla ice cream, or chocolate sauce. In a small saucepan over medium heat, saute the chopped apples in the coconut oil. As the begin to soften, add the cinnamon, making sure that it gets all the apples. Continue cooking until there is a kind of gooey juice and is soft and moist. When it reaches this stage, add the currants or raisins if desired and cook until the currants/raisins are plump. Remove from heat and add vanilla, if desired. Serve and enjoy!